Layers are a very important component of working with AutoCAD. They control the colour, linetype, and lineweight of your objects. They control the visibility of objects and they control what is plotted and what isn’t plotted. Layers organize your drawings, by providing “buckets” to group objects with the same properties. 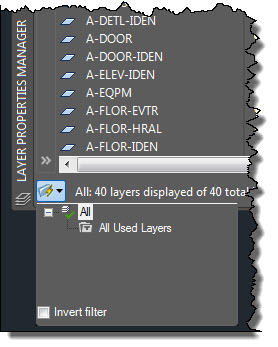 Even with the layer automation of many of the vertical “flavours” of AutoCAD, like AutoCAD Mechanical or AutoCAD Electrical, it is still important to understand layers and use all the layers tools within AutoCAD to your advantage. In this series of posts I’m going to dive deep looking at all aspects of layers, from creation to deletion. In Part 1 lets look at an underutilized feature of layers…. Layer Filters. Introduced in AutoCAD 2000 Layer Filters do exactly as named, provide a quick method to filter your layers. They reduce the list of layers into a usable “chunk” and provide tools to work with the filter as a group. 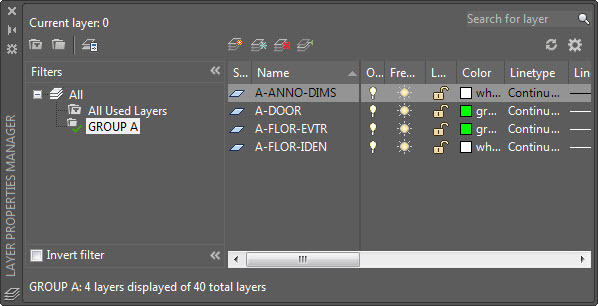 Layer Filters are built into the Layer Palette but may be minimized and not visible. Using the >> and << buttons on the left side of the palette you can minimize and maximize the Layer Filter portion. 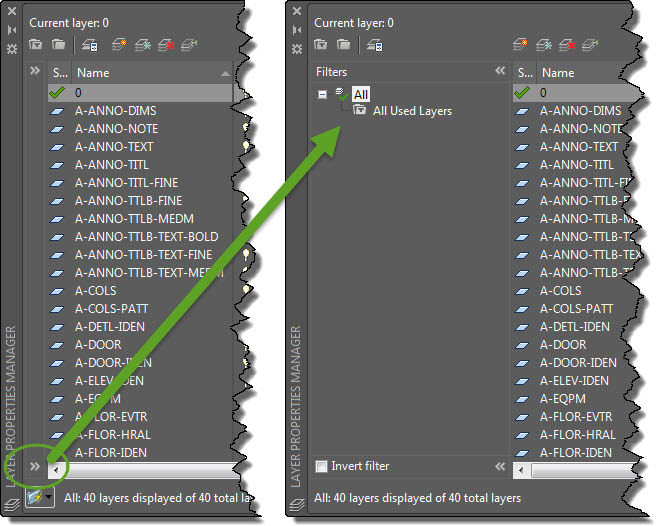 To create a new Layer Filter use either the buttons along the top left of the palette or right-click on the All at the top of the layer tree. 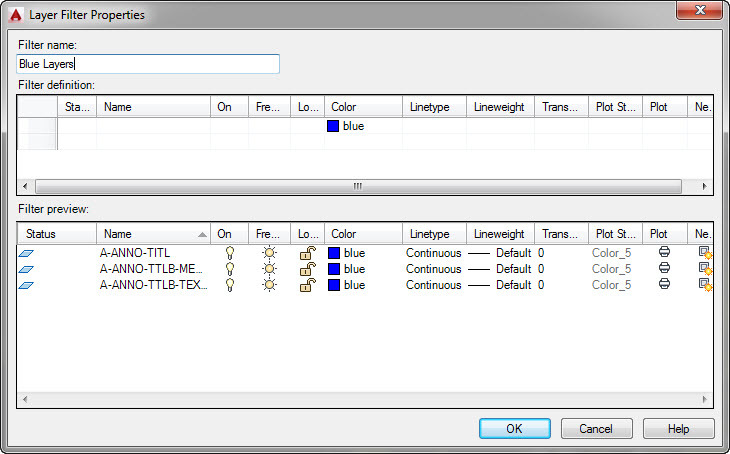 Property type filters are used to filter the layers based on their properties. Want to only see layers with a color of red? no problem. Want to see just the red layers that are not frozen? no problem. The filter dialog even allows for AND and OR type filtering. For example, show me the layers that are Red OR Green… or show me the layers that are Red AND Frozen. 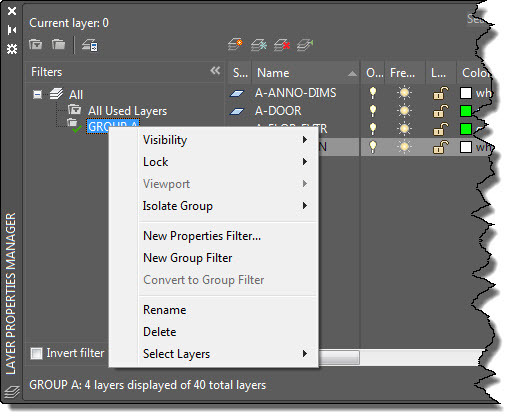 Property Filters are created and managed via the Layer Filter Properties dialog. The top portion of the dialog are the inputs to build the definition. The bottom half of the dialog is a preview of the layers that will appear once your layers are filtered. To apply your filter to not just the Layer Palette but also the layer drop-down in the ribbon / toolbar you can enable the option “Apply layer filter to layer toolbar” in the options. With this enabled you will only see the layers included in the filter AND the active layer. By right-clicking on the filter you will see options for freezing / thawing, turning on/off, and locking/unlocking all layers in the filtered list. This can be significantly faster than trying to locate and select each layer in a long list. An additional right-click option provides the ability to isolate the filtered layers so that they are the only objects that appear in the drawing, all other layers are frozen. As you can see Layer Filters can make your life much easier, especially when your drawings have a larger amount of layers. Why fight through a long list when AutoCAD can simplify the process for you? 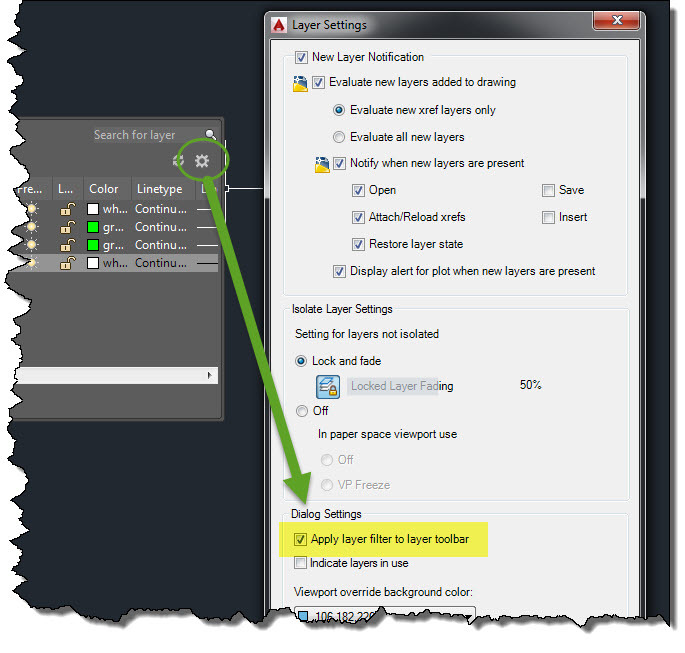 This is part 1 of my deep dive into AutoCAD Layers. Part 2 will be on Layer Filters distant cousin Layer States. If there is some part of Layers you’d like me to focus on please let me know via the comments.